So, goodbye winter. It’s time to put aside the heavy coats and thick sweaters. This final transition from winter to spring look is all about meeting spring with the fierceness of a well-spent winter. Jumpsuits are still a thing. For a petite woman like me, the wider leg is just wide enough to give me a bit of length, but it’s not so wide that it makes me look hippy and short. I’ve paired the sleeveless jumpsuit with one of the flirty lace undershirts so popular this spring. 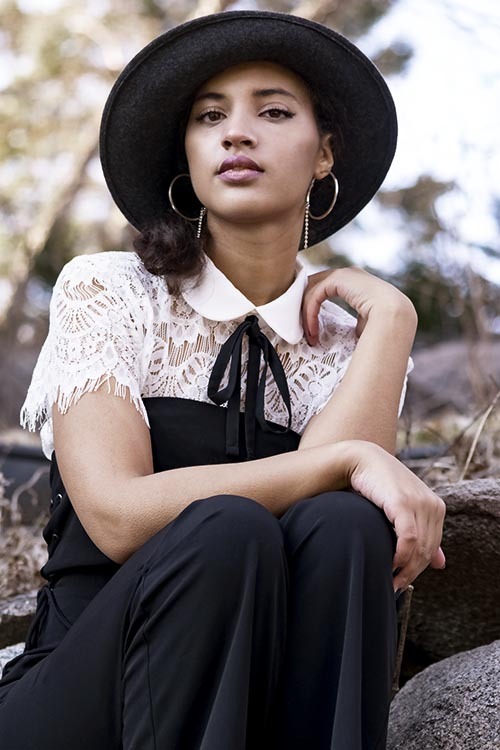 The black and white contrast, the lacy top and laced-up jumpsuit work together to provide a polished, sophisticated look, while the hat and hoops add a touch of street-wise. Dress this look up with a good heel, or you can embrace street-style by adding a plaid top beneath the jumpsuit and a pair of Converse to give you two unique and easy-peasy spring transition styles.